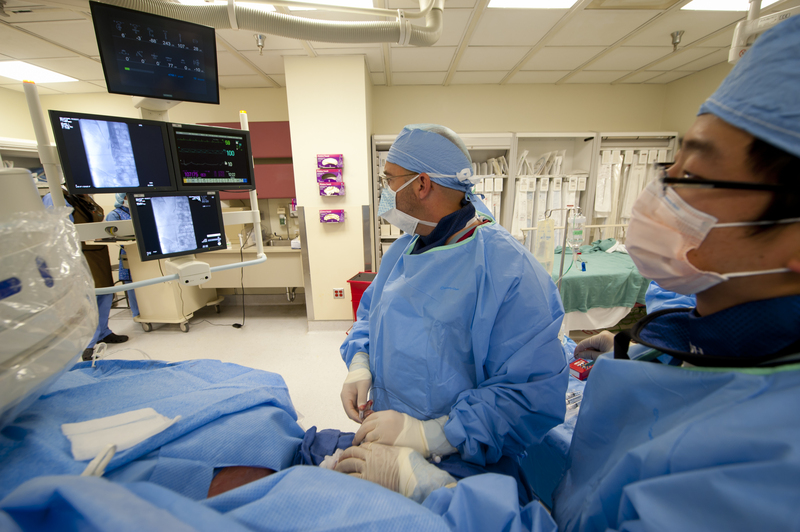 What exactly is an Interventional Radiologist? The VCU Baird Vascular Institute’s medical director, Dr. Malcolm Sydnor, uses fluoroscopic guidance to treat a patient with a vascular problem. Many of the physicians at VCU Baird Institute are Interventional Radiologists. You may have wondered about our specialty, so allow us to explain a bit more. Interventional Radiologists are specially trained to use minimally invasive, image-guided techniques to diagnose and treat a variety of issues within the human body. The goal is to use the least invasive treatment plan required in order to address the issue, avoid risk to the patient and impact on the body and to speed recovery time. Many times, interventional radiologists are able to treat an issue with less risk, less pain and less recovery time than traditional open surgery. Interventional radiologists use a variety of tools such as ultrasound, X-ray, CT and MRI technology to target medical issues within the body. Recognized as a medical specialty by the American Board of Medical Specialties, interventional radiologists are board-certified physicians with additional advanced training in minimally invasive, targeted treatments performed using imaging to guide them. Their board certification includes both Vascular and Interventional Radiology and Diagnostic Radiology, which are administered by the American Board of Radiology. Interventional radiologists pioneered many of the non-invasive techniques that are commonly used today, such as angioplasty and the catheter-delivered stent. Trained in both radiology and interventional therapy, interventional radiologists possess a combination of skills that are unique to their specialty. Today, an interventional radiologist can treat many of the procedures that once required surgery with a less invasive treatment option. Although varicose veins may not cause problems, sometimes they cause aching pain, throbbing, and discomfort in the legs, and occasionally, varicose veins can lead to more serious health concerns. The unsightly nature of varicose veins may make patients less likely to engage in warm weather activities they not only enjoy, but are also good methods of exercise, because they are embarrassed by the appearance of their legs. Treating varicose veins may mean doing away with compression stockings or other restrictive, uncomfortable methods of long-term treatment. When home remedies such as compression stockings, elevating the legs, and avoiding long periods of continuous standing or sitting are no longer relieving the symptoms, it may be time to consider other options. Finally, today’s treatments are less invasive, less painful and require much less recovery time than treatments of the past. How long should a port placement take, and what should I expect? VCU Baird Vascular Institute is strictly an outpatient facility, meaning that with all procedures, you should be able to go home the same day. The procedures and recovery time can vary from 45 minutes to a few hours, depending on your unique case. Generally, a port placement takes between 1 to 2 hours. You may be given medication to help you relax. For the procedure, two incisions are made, one in the chest and one near the collarbone. A needle will be inserted into the skin, creating a tunnel. 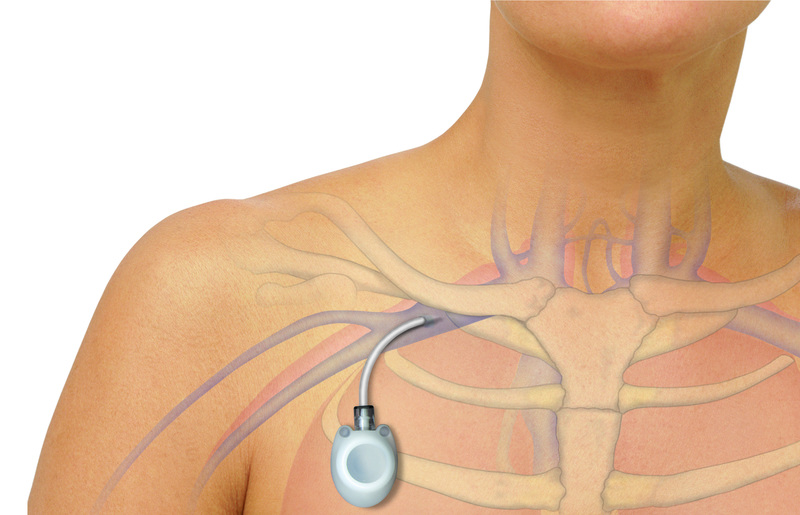 The port is placed in the tunnel with the tip of the catheter in a large vein near the heart. Imaging equipment will help the physician find the best location for your port placement. You will be monitored by a physician and nurse before, during and after the procedure. What is Image Guided Tendon Treatment? Can it help with my mobility? Image guided tendon treatment relies on ultrasound technology to identify, breakdown and remove pain-causing damaged tendon tissue. The surrounding healthy tissue is not disturbed and the treatment stimulates healing. The technology used (Tenex Health TX), is an FDA cleared device that can be used in a nonsurgical setting. If you’ve had to give up your everyday activities along with your favorite ones, image guided tendon treatment has the ability to get you back to what you love and need to do in 6 weeks or less. With no stitches or general anesthesia, this treatment offers minimal downtime for a rapid return to normal life. The process requires only local anesthetic to numb the area. You do not need general anesthesia (to be put to sleep) as you would in traditional open surgery. When the procedure is completed, only a small adhesive bandage is used. No sutures or stitches are generally needed. You should not feel any pain during the treatment, only a slight pressure if anything. After the treatment during your recovery, you may feel sore in the treated area for a short period of time. Most patients use over-the-counter medication for any discomfort. Typically, the treatment takes 20 minutes or less to complete. This includes the time to clean your skin before the treatment to placing a small adhesive bandage over the micro incision upon completion. Unlike traditional open surgery recoveries that may take up to 6 months or longer, the image guided tendon treatment recovery period is expected to be 6 weeks or less for a return to your normal activities. The specialists at VCU Baird Institute are excited to offer this advanced technology technique to our patients. 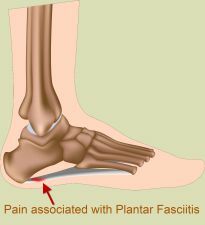 If you have already explored multiple treatments such as rest, ice and cortisone injections to treat conditions such as plantar fasciitis, you may be ready for the next step in your treatment. Give us a call at (804) 828-2600 to discuss whether it’s right for you.